Since version 0.9.6 DNGMonochrome contains a white balance slider. The white balance slider only has an effect on DNGs that are filtered with the RGB filters. You cannot preview the white balance change upfront. The changed white balance is used in the conversion from color DNG to RGB filtered monochrome DNG and the effect of the change will only be visible in the converted monochrome DNG (after conversion). So yes, you have to gamble a bit here and experiment on some photos to get to your preferred setting. I might change that in future, possibly using the preview photo to show what the white balance is actually doing to the color DNG, before you start converting to monochrome. Changing the white balance of the color DNG before the DNG is filtered and converted can have a strong effect. Going to 2000 kelvin on a daylight photo, and then green filtering might result in an almost black photo... strength and white balance can also enhance eachother, so you'll have to experiment a bit to get the best result. If you're satisfied with the white balance as is, then I'd advise to leave it alone and just use the strength slider for the RGB filters. Changing the white balance means shifting the white point in a color space. 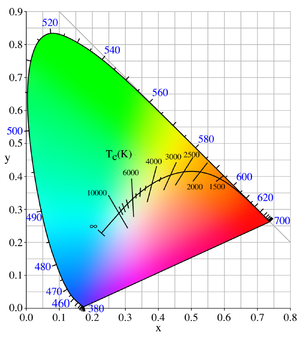 The white point determines which amounts of what color within the color space - added up - represent 'white'. In DNGmonochrome this happens within the XYZ color space. The white point within that space is first calculated by applying the numbers given in the ShotAsNeutral tag of the photo, where the camera stores the white balance setting specific to the scene shot. Either 'auto', set by the camera, or manual, set by the photographer (tungsten, daylight, cloudy etc, or a direct kelvin setting). Then, if the white balance is altered by moving the slider, the white point shifts within the color space over a designated arc. On that arc, every point has a kelvin temperature representation. The arc lies between blue and yellow (east to west and v.v. if you will). See this image of the XYZ color space with the Kelvin arc. The white balance slider in Lightroom goes from blue (low temperature) to yellow (high temperature), whilst clearly in this image you can see it's reversed. Blue has the high temperature, and yellow has the low one. The temperature presented in Lightroom is correct, because here's the confusing bit: if you move the slider towards the blue, the white point is actually moved towards the yellow in the color space ( = lower temperature). The blue on the Lightroom slider is to indicate the effect on your photo (turning blue when the whitepoint shifts towards yellow), not to indicate the position of the white point in the color space. I agree it's confusing, because of this reverse effect color spaces can have on photos. There's an argument to be made here for reversing the scale, since clearly Lightroom is presenting two different things: the actual setting of the white point (in temperature) and the effect it has on your photo (through background coloring of the slider). It's a bit of a user interface conundrum. In DNGMonochrome I follow the same weirdness by the way, as to not confuse you more: the white balance slider in DNGMonochrome works exactly the same as the one in Lightroom. If you move it towards blue, your photo will get 'cooler' (you won't see that anywhere, but the filtering reacts on it). Now, Lightroom has a second slider, called 'Tint'. And as you can see in the above image of the XYZ color space, what the tint slider does is move the white point between magenta and green (north to south and v.v if you will - also having the oppositie effect in your photo). The Kelvin arc is kinda officially recognised, but I'm not so sure about the tint slider. So in DNGMonochrome I stick to only the 'official' white balancing for now, through only one slider with the Kelvin setting. It's not difficult to also incorporate the tint slider, but seeing the lack of instant feedback on any change (that might change in future releases) it's hard enough to guess the effect of only one slider. It more or less works the same as in Lightroom (although you don't see the immediate effect anywhere, only after converting the photo), but in DNGMonochrome it only has an effect on photos that use the RGB filters. Those filters use the white balance setting. The RAW filters don't look at white balance, nor does the regular monochrome result.